THEY died in their thousands and if they had failed in their objective millions of British people would have known severe hunger, even starvation; the war would have been lost and the history of the world would have been entirely different. Yet the 250,000 sailors of the British Mercantile Marine – today known as the Merchant Navy – have largely been forgotten, their stories lost as history books and TV documentaries focus on the bloody, muddy fields of Flanders. Now a small group of amateur historians in Hartlepool – the sea-centred town devastated by the navel bombardment of 1914 which lost more than 260 seafarers in the war – have done something to remember them. It is worth putting the conflict at sea in context. At the outbreak of war, Britain owned nearly 40 per cent of the world’s merchant steamship tonnage. Its importance to keep Britain – an island and imperial nation dependant on sea trade like few other countries could ever be – supplied with food and equipment vital for the war effort can hardly be overstated. At one point German U-boats were sinking more ships than could be built to replace them. If that had continued, Britain’s ability to fight a war would have sunk with them. Ironically, it was a British naval blockade that would eventually starve the German nation into submission. It is without doubt an epic story of courage and sacrifice that should be much better known – a situation now being addressed through the Hartlepool Heroism and Heartbreak project, which is being managed by Gary Green on behalf of the Nautical Archaeology Society, “The idea to remember the seafarers really took shape in 2013, just as we were successfully completing our Hartlepool History Then and Now project,” says Mr Green. “At this time too, there was a lot of media coverage surrounding the forthcoming Centenary of the First World War. They established a new project, eventually titled Heroism and Heartbreak, secured £54,500 of Lottery-cash, and got to work; hard, often thankless work, trawling through forgotten lists and archives. The hard work began to pay off, the public responded and the tales of brave deeds, untold for a 100 years, began to come in. Among them were some of the worst tragedies. 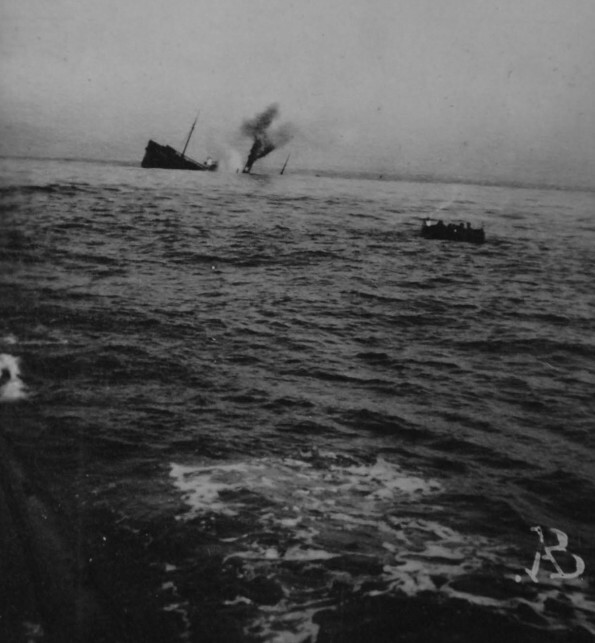 among them the sinking of the steamship Manchuria, torpedoed on October 17, 1917, killing 11 men from the Hartlepools – Joseph Shepherd Andrews, William Bell, Carl Christian Christensen, John Garland, Albert Hanson, William Liddle, Tom Prin Mack, Charles Osbert Mordaunt, Daniel Nichol, Arthur Ernest Rumsey, William Stoddart. Then there was the loss of a small, working tug from the town, The Stranton, which was requistioned by the Admiralty and became HMS Char. Her original eight crew – seven from the Hartlepools – all volunteered to stay with their ship, and were lost when she foundered off the Downs following a collision with the Belgian steam tanker Frivan, on January 16, 1915. The seven local men were Edward Booth, William Booth, Ralph Fergus, Matthew Hastings, William Hatch, John Eden Hunter, and George Nossiter. There were also the brieftest of records of merchant navy and fisherfolk killed in less commemorated, but just as tragic ways during the war. Perhaps inevitably, their stories struck a special chord in Hartlepool, a town that exists because of the sea. Mr Green, who laments the lost information about these heroic men despite his volunteers’ dedication and hard work in going through thousands of archives, tells of his pride in the project. Find out more or offer your family’s story at hhtandn.org/hartlepool-at-war/wwi or call Hartlepool Central Library on 01429-242909. An exhibition marking the successful conclusion of a Hartlepool-based project, titled Heroism and Heartbreak – True Tales From The Hartlepools At War runs until January, 2017 at the Museum of Hartlepool.